Hmmmm, do you ever feel like something good and sweet but has got to be easy to make as well? These are perfect! Making these can also be a fun project for kids. They love these .. adults even more! I used the microwave as it is quicker, less messy and easier. Put the broken-up chocolate in a glass bowl. Start on 40 seconds bursts on high to melt the chocolate. Chocolate retains its shape when melting in the microwave, therefore, keep stirring to ensure it is melted so that you will not burn it. Repeat until it completely melts. When melted, swirl in the nutella, add the cornflakes and stir well to combine. 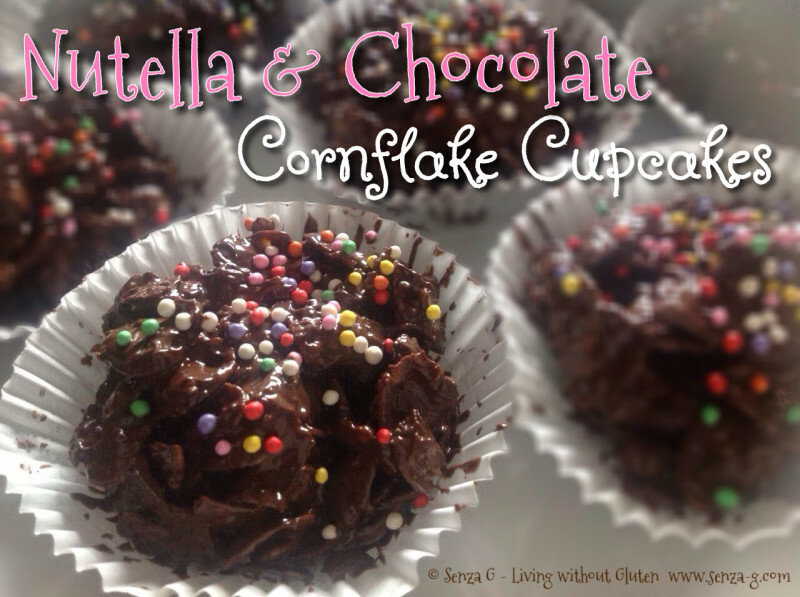 Spoon the coated cornflakes into muffin paper cups and decorate the top with gluten free coloured sprinkles. Refrigerate at least twenty minutes to harden. You can also add some chopped hazelnuts, or raisins or even some coconut.